This past Saturday, Green Phoenix Farms was happy to host a “Soft” Opening for a collaborative project with a local non-profit ministry, Feed By Grace. This project is a 2000 square foot Aquaponic Greenhouse that contains a 1500 gallon fish tank, 108 square feet of Media-based Grow Beds, 504 square feet of Deep-Water Culture (DWC or “Raft”) Troughs and 48 square feet of aquaponic Wicking Beds. The fish tank will ultimately house 200-300 pounds of Hybrid Striped Bass, the DWC Troughs will house over 2,250 individual plants (a rough weekly harvest of 400-500+ plants), and the Wicking Beds will allow for the sustained growth of root crops from Aquaponics. The event was covered by the Fort Worth Star Telegram’s own Sarah Bahari, and the article can be read HERE. A unique partnership between a Fort Worth ministry and a Dallas-based business enterprise focusing on Aquaponics education was showcased Saturday, February 1. An open house scheduled from 9 a.m. to 1 p.m. occurred at the garden site operated by Feed by Grace in Fort Worth, TX. The plot of land in question sits almost under the freeways in a part of town that has not witnessed successful farming for a long time. 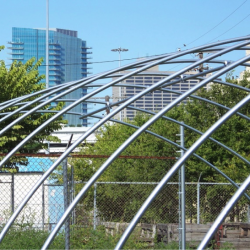 Under a plastic-wrapped “hoop house” in the shadow of downtown’s tall buildings, the installation is the first-of-its-kind (in North Texas) aquaponic growing system completed by Dallas-based Green Phoenix Farms. The company specializes in educational seminars, and is the leading aquaponic design and installation company in North Texas. This innovative sustainable farming method uses fish and plants to nourish one another in a symbiotic growing system, and it is adaptable for large-scale commercial production as well as for backyard gardening. The joint endeavor, termed the Aquaponics Discovery Center, was funded in part by an anonymous donation to Feed by Grace. This installation marks the first of a series of similar partnerships, according to Green Phoenix Founder and President Adam Cohen. Aquaponics, he notes, has “immense implications for sustainable and efficient farming, particularly in areas where soil and water will not support traditional agricultural methods.” He added that his company is discussing similar partnerships with other non-profit organizations; additionally, he noted that school districts and even individual teachers with classroom gardens are installing demonstration systems. Aquaponics, although not a new concept, has only recently been introduced in the United States. It combines “hydroponic” (non-soil planting) methods with aquaculture (fish farming) in a closed loop system where the fish and the plants nourish one another in a completely natural manner. Water and energy consumption are minimal, and only the fish must be fed. Once a system is properly balanced, it can operate efficiently to produce large crops of harvestable produce, particularly herbs and salad greens, on a regular basis. Other crops, including tomatoes, cucumbers, peppers, squash and beans, are being grown successfully and seem to thrive in North Texas demonstration systems. Even though the system is currently being “cycled,” and is not yet stocked with fish or plants, it is anticipated that the first crops might be available for harvest within 6-8 weeks. With the greenhouse cover, nearly year-round production can become a reality. All of the harvest will be made available by subscription to supporters, and will be distributed for pickup at specified locations. Last summer, some of the produce from the garden was also sold in that manner. Feed by Grace Founder Neale Mansfield views the Aquaponics facility as another step along the path toward creation of a true community garden in the East Lancaster neighborhood. 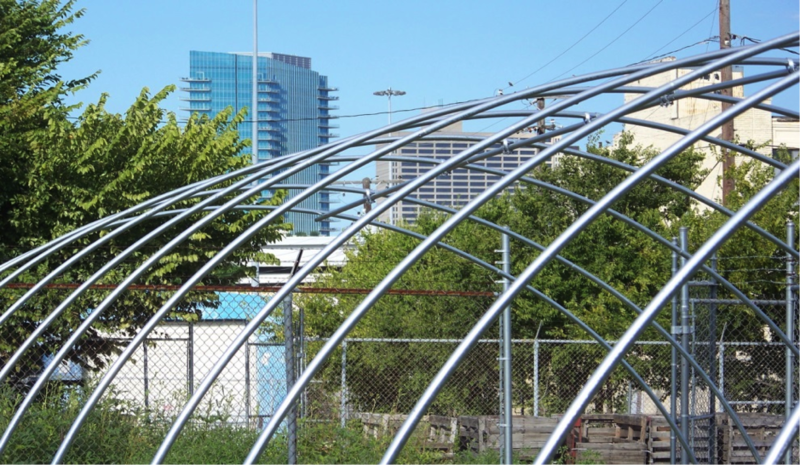 From its founding in 2004, the mission of the non-profit ministry has evolved; in 2012 Project Growth was created, and the ambitious plan involves a multi-faceted approach to urban agriculture. The Aquaponics facility is one part of a whole that will include more than 80 raised bed gardens, chickens producing farm-fresh eggs, a composting operation and a worm farm. The ultimate goal is to provide employment for the local homeless population, create a marketplace of buyers for the food, supplement food offerings for the needy, and build a sense of community spirit in a formerly blighted area. Supporters of the Feed by Grace mission and programs are invited to attend, as are area residents who are interested in the gardens. In addition, anyone with an interest in learning more about aquaponic gardening is encouraged to stop by. There is no charge for the open house and parking is available.